THE LAST time I saw Morgan Creative in action was with its imaginative staging of Crime and Punishment at Druid’s Mick Lally Theatre eight months ago. 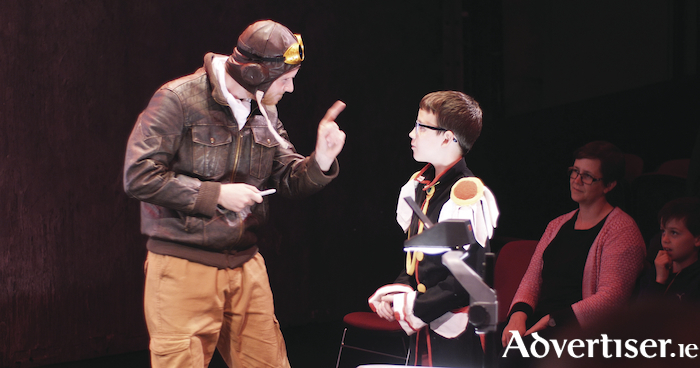 This week the company returned to the Mick Lally Theatre for the Galway Theatre Festival with another a literary classic - Antoine de Saint-Exupéry’s The Little Prince. The Little Prince, translated and adapted by Oisín Robbins, is a world away from the existential angst of Dostoevsky, but Morgan Creative proved equally adept at staging this warm and sprightly philosophical fable as they did with the brooding darkness of Crime and Punishment. In de Saint-Exupéry’s novella, an aviator (Seosamh Duffy ), crashes in the Sahara where he meets the enigmatic Little Prince (Alex Hughes ) who has come to Earth from another planet and is repeatedly baffled by the silliness of adult behaviour and attitudes he has encountered in his galactic travels. He also interacts with a rose, a snake, and a fox, and learns and transmits vital lessons about life and relationships. The Little Prince’s encounters and travels are inventively and charmingly rendered by director Luke Morgan’s lively production. Drawings, silhouettes, projections, snatches of ambient sound are all part of the show’s tapestry which is further enhanced by Jake Morgan’s score. The show also has engaging performances from both Seosamh Duffy and young Alex Hughes and it thoroughly delighted the large attendance, both grown-ups and children alike, who filled the Mick Lally Theatre. The Little Prince now embarks on a brief national tour and before returning to Galway next month, when it will play Nuns Island Theatre from August 16 to 19. Mark the dates down and catch it if you can.